As soon as I mentioned I’d be starting Rifaximin + Neomycin again, everyone started asking me to share what the days were like on it; side effects, ups, downs, etc. 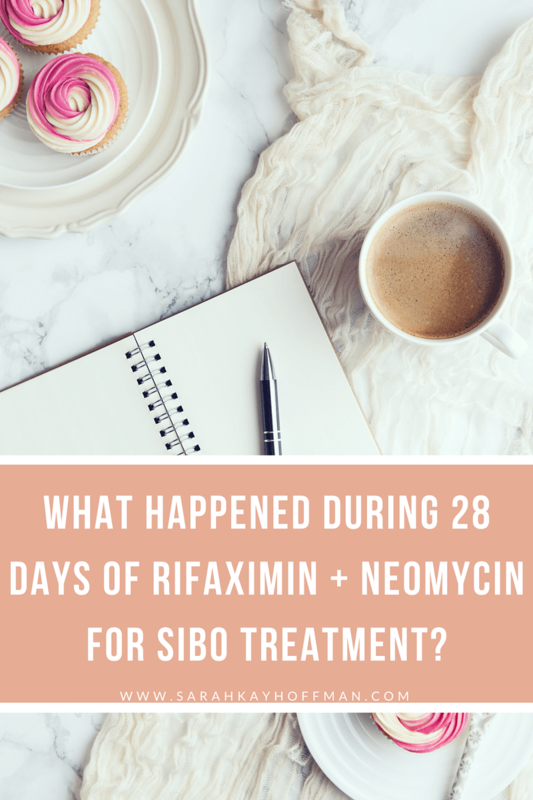 So I chose to document the 28 days, and now that they are over (ended on June 28, 2018), I’m ready to share my 28-day Rifaximin and Neomycin SIBO journal with Y’all. I wanted this to be as helpful and useful as possible for anyone who might come across this blog post without me needing to give every single last detail about each of the 28 days. I used a small notebook, in fact, it’s just my journal and I used the last 28 pages of it for this little experiment. At the top of each day I wrote (example): Day 1: Rifaximin + Neomycin Friday, June 1, 2018. My food didn’t change a ton. I toggled between no, low, and high-FODMAP, depending on the day, how I was feeling, and what I was comfortable with. Every single day from Day 1 – Day 14, my medicines consisted of Rifaximin x 3 per day, Neomycin x 2 per day, LDN (low dose naltrexone) at night before bed, WP Thyroid on an empty stomach immediately upon waking up each day. Once Day 15 hit, all medicine was the same except no more Neomycin. Almost every single day, my supplements stayed consistent with just digestive enzymes, HCL, and Adrenal Glandular. There was a period of time when I took Antrantil (2-3 times per day x’s 2 pills per time) as well. On day 1, I felt great until 4pm when I started feeling semi-nauseous. Just prior to starting, though, I had been low-FODMAP so I wasn’t expecting to feel anything less than great. I also forgot to eat FODMAPs on day 1, so there was that. On day 2, I still didn’t have any bloat, but the nausea started hitting me. I got some ginger mints and that worked wonders. It was a Saturday so I had a long, 8-mile run that day which I noted left me completely wiped out and fatigued. At the beginning of that week, days 10-13, I was in New York for work. When I get home and settled on day 14, I noted: “Horrible fatigue today. A lot of nausea. Coffee aversions. Overall down day.” I will never forget this day because I got out of bed that morning thinking (remembering) how it was around day 13/14 of the previous SIBO anitibiotic cycles when seemingly overnight I felt 100% again. I had so much hope, but not even an hour after waking up, I was back in bed, thinking maybe I had the flu. I felt miserable. And when I did spring back to life, I began having the coffee aversions, which lasted for most of the rest of the 28 days. I mean, who was I anyways?! But that was day 14, which meant the final day of Neomycin. Miraculously, on day 15, all nausea went away. Don’t you dare think this is made up, either. It’s a very common side effect of Neomycin. The nausea is the worst. I did a hard 20-minute workout that day, and at night I felt so fatigued, drained, and my throat even hurt some. By the way, at this point in the game, my weight was still creeping up some. The next day, on day 16, I felt achy and sick again. I was so achy that I even had to take some Advil to get through the day (which I never, ever have to do unless my female monthly friend is visiting). Because I was getting so afraid, I figured I might as well start Atrantil to see if that would help. I was insane (yes, looking back, just pure insanity) and ran an “easy” 7 miles that day. And looking back, it’s no surprise, then, that on day 17 I was still so achy and had to take Advil yet again. I also developed a stye in my eye. But at least I completely took the day off from working out that day. I should mention that even though I was on the struggle bus this entire time, I was going to the bathroom every single day like a normal person with BM’s that were just fine. That was my sign for hope that repair could happen. So on day 20, I stopped eating the FODMAPs and grains, dairy, and anything else that’s “technically” encouraged during the antibiotic protocol. I also started fasting again, and fasted for 14 hours that night/morning. I stayed the course, but on day 22 felt the super bloat again. I noted: “All this bloat — when I started Atrantil again?” But I stayed with the Atrantil through day day 24. On day 25, I cut the Atrantil cold turkey. Day 25 was miserable (I also ran 6 miles that day), but I decided to finish my last few days with some FODMAPs and grains and carbs sprinkled in here and there, but no Atrantil. Here is everything from day 26. Notes: BEST day yet! ZERO bloat. I finished day 27-28 the exact same. No bloat; perfection. 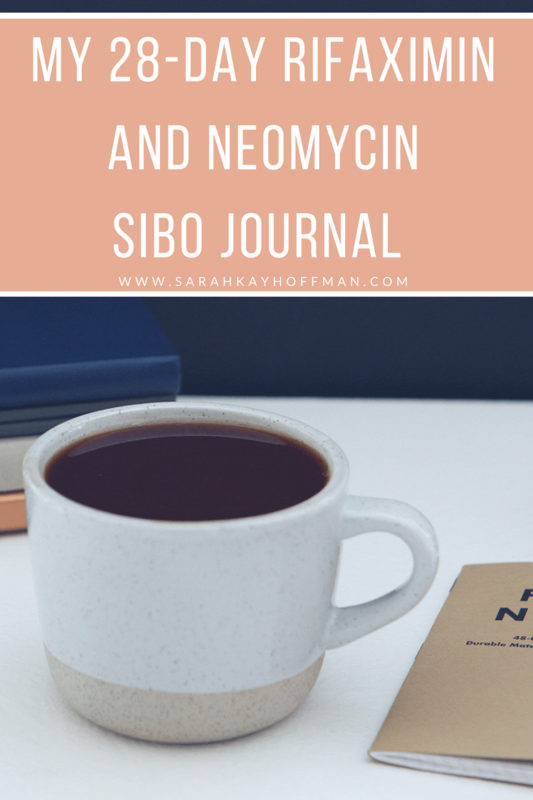 And there you have it….my 28-day Rifaximin and Neomycin SIBO journal. What’s the point of keeping a meticulous journal so we can see progression (or regression for that matter) like my 28-day Rifaximin and Neomycin SIBO journal or a Bullet Journal for gut healing if we’re not going to act upon the findings? 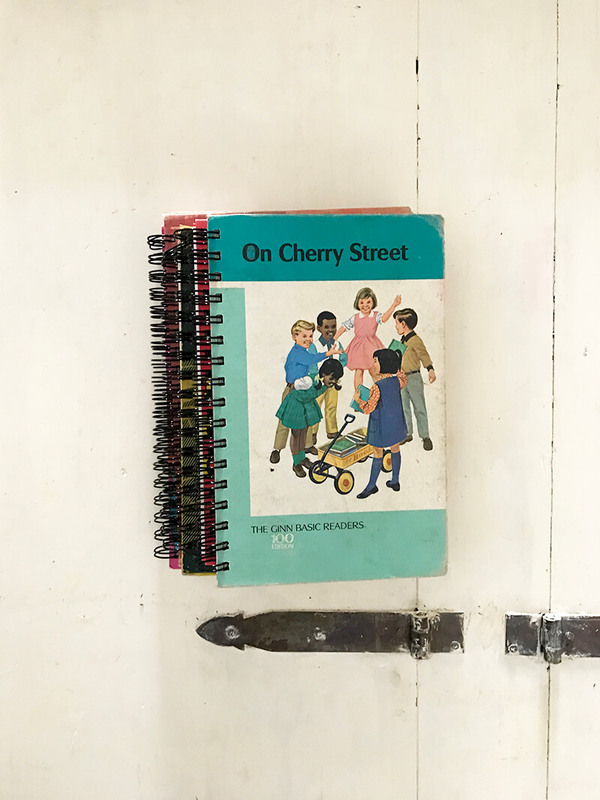 While I did want to keep track of all this so I could share the experience and journey with those who have SIBO and/or are thinking about doing the antibiotics, I also wanted to do it for myself – to understand exactly what to do next and why. Because listen, my testing results for anything underlying are still inconclusive. Numbers are off, but specific tests are still negative (i.e. I don’t have Lyme disease). I will never stop seeking the real answers (i.e. mold test, the Colonoscopy and Endoscopy, etc.) as to why I would relapse 4 times now when my lifestyle would (otherwise) indicate a relapse should never occur. However, upon studying my 28-day Rifaximin and Neomycin SIBO journal, there are things I know for sure. I can draw many conclusions, and I can take the very worst days and see possible connections for why they were the very worst days. So stay tuned….I still have two more blog posts to share with you on this topic. Questions? Ask in the comments below or EMAIL ME. What are your conclusions about your experience with Antrantil? You r journal seems to conclude it made you worse. Hi – Yes, THIS time it DID make me worse. That hasn’t always been the case, though, which is why I don’t want to say too much negative about it. I have a planned post for Atrantil coming as well. Hi Irene – That’s all in my e-book, but I always ate FODMAPs during treatment (and most definitely for 10 days). You don’t have to eat a ton, but it’s generally accepted that you should be eating some so the antibiotic can do its job and fight off the bacteria. Did you get your Rifaxamin from a US pharmacy and did you lose the weight you gained? No, I get my Rifaximin from a pharmacy in Australia. I wrote about it via a post called, “Waiting on Rifaximin.” And no, I haven’t lost ALL of it yet, but it hasn’t even been a week since I ended it. That said, ALL bloat weight is gone and the scale continues to go down without making any changes (except the changes to chill the #$%^ out). I know you wondered about my Ginger mints, too. They are these – affil link – https://amzn.to/2lTlQGY + I also use Ginger Chews frequently – https://amzn.to/2NkTeTo Hope that all helps! Going to be honest, your diet during most of this protocol sounds like the exact opposite of what it should be for someone with SIBO. If you’ve got SIBO, the microbiota in your small intestine is very out of balance, and your good probiotic bacteria populations are too weak. FODMAP’s, dairy, grains are going to make the situation worse, not better (independent of whether or not you’re taking antibiotics). You need to stop the disaccharide sugars, grains and starches for a while 100%. There should be no bloating. If you’re bloated it means bacteria and/or yeasts are present (at the wrong places in your gut) that are metabolizing what you’re eating and producing gases. That’s not good and the exact opposite of what you want. You’re taking large amounts of antibiotics to reduce or kill off the population of these things, but at the same time you’re eating FODMAP’s and feeding the buggers. It’s not going to work nearly as effectively. I know there’s a theory being tossed around that you should feed the bacteria while taking antibiotics, but I’ve seen zero evidence of this. You don’t feed a pathogen while you’re trying to kill it. You want to do the opposite: Starve the bad bacteria out. Attack them with antibiotics and biofilm busters. Don’t feed them. If it was me (as I’ve done this already), I would be eating a very basic zero FODMAP diet during the antibiotics. After the antibiotics, I would be eating *very* strong probiotic yogurt, and over time trying to *slowly* introduce prebiotics such as Inulin and arabinogalactan. It may take several waves of antibiotics followed by very strong probiotics to shift the microbiota in your small intestine back into balance. If you can’t tolerate Inulin it means your gut is still too out of balance and you need to work on it more. Prebiotics like Inulin feed the parts of your microbiota that need to be strong in order to recover from SIBO. Unfortunately, some types of bad bacteria can also metabolize Inulin, and if your overgrowth is still present it won’t work. Rich – If you read the post closely enough, you’ll see that I did BOTH – both fed them and then starved them. For me, it worked great. Thanks for your thoughts. What dosage of the Rifaximin and Neomycin did you take each dose (1200mg and 1000mg or smaller)? How many times a day? I want to tell my doctor how to write the protocol. I don’t remember the dosage, but I took Rifaximin x 3 per day (4 weeks) and Neomycin x 2 per day (2 weeks). Can one be bloated and have no pain or gas? I look 3-4 months pregnant, and I’m a MAN, and have been either constipated or loose, but don’t have any pain. Yes of course. Everyone is different in their symptoms and reactions.